AGRIS team at the Food and Agriculture Organization of the United Nations (FAO) takes this opportunity to inform all interested parties that in September 2017 AGRIS has exceeded the threshold of 9 million records ! (9,025,192 records). AGRIS team continues to work on consolidating the AGRIS (INTERNATIONAL INFORMATION SYSTEM FOR THE AGRICULTURAL SCIENCE AND TECHNOLOGY) platform and its services to provide better access and visibility to the information resources that are being disseminated through AGRIS. 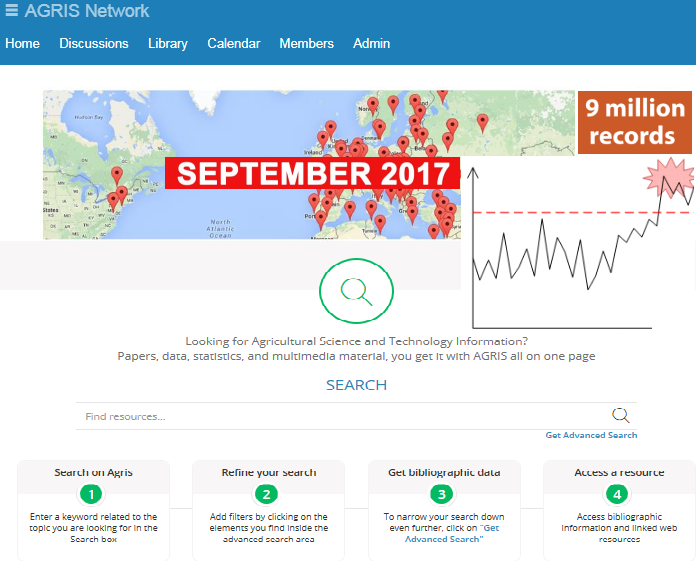 AGRIS content (which comes from than : 350 data providers and 140 countries) is used by students, researchers and has more than 400, 000 agricultural research professionals worldwide accessing AGRIS resources each month. The AGRIS community is comprised of more than 9,500 users registered on its portal.